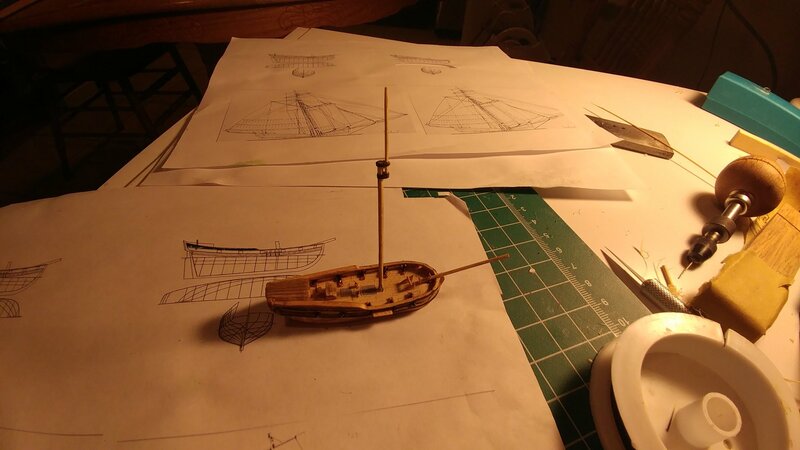 To make sure I have the right spacing for the bowsprit and the windlass I'm putting the bowsprit in next. I cut a notch in the front bulwarks to get the angle of the bowsprit according to the plans. I glue the bowsprit in the notch and to the deck. 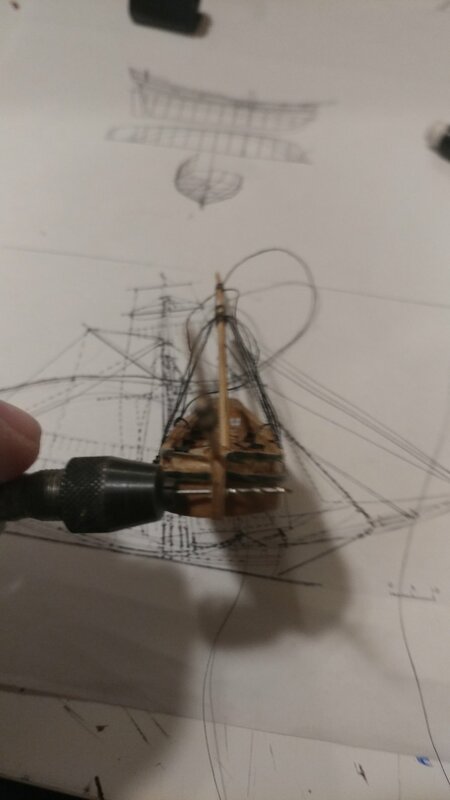 I'm not worried about the bowsprit being pulled up by the rigging because of the bobstay. 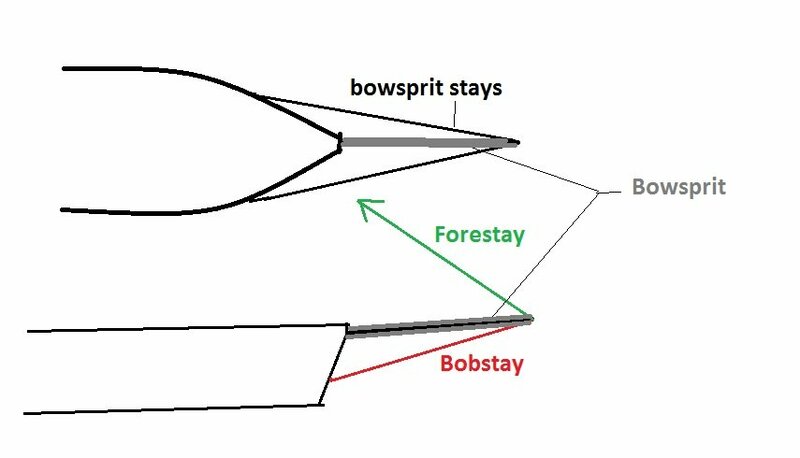 The bobstay runs from the bowsprit to the stem. 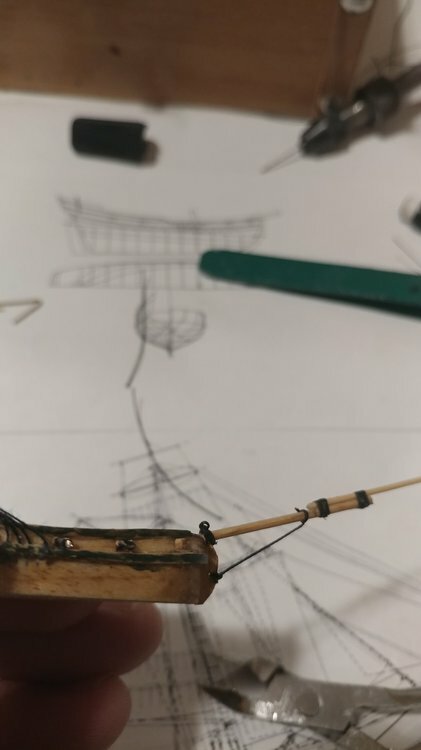 As the bowsprit is pulled up the bobstay pulls it back and creates a fulcrum. 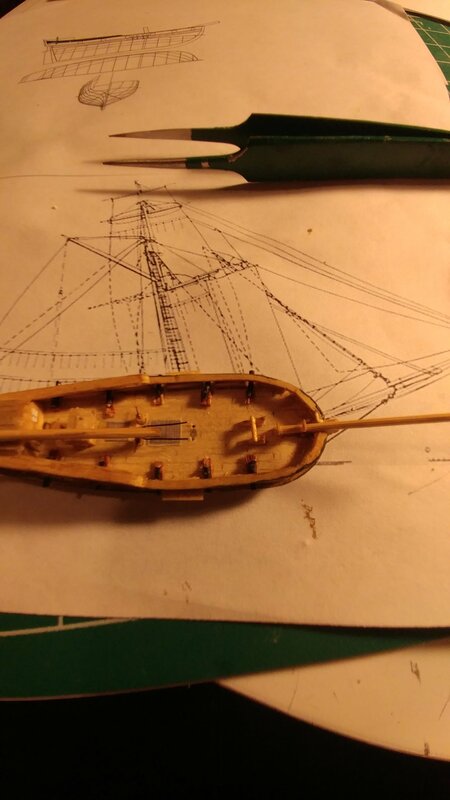 As the end of the bowsprit is pulled up the end attached to the hull will be pushed down. In order to attach a bobstay to a stem I gotta have a stem. 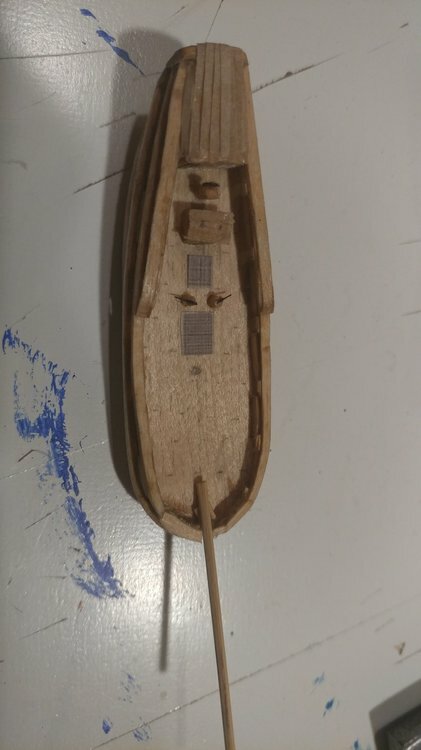 Starting out I round out a piece of wood to match the hull. 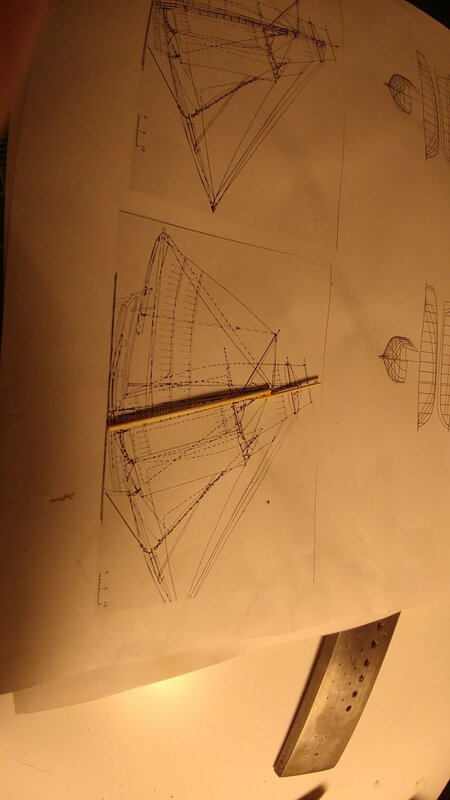 I cut the top to match the angle of the bowsprit then round out what will be the front of the stem. Little more sanding to shape it and the stem is good to go. I'm not doing the bobstay just yet but its something to keep in mind. 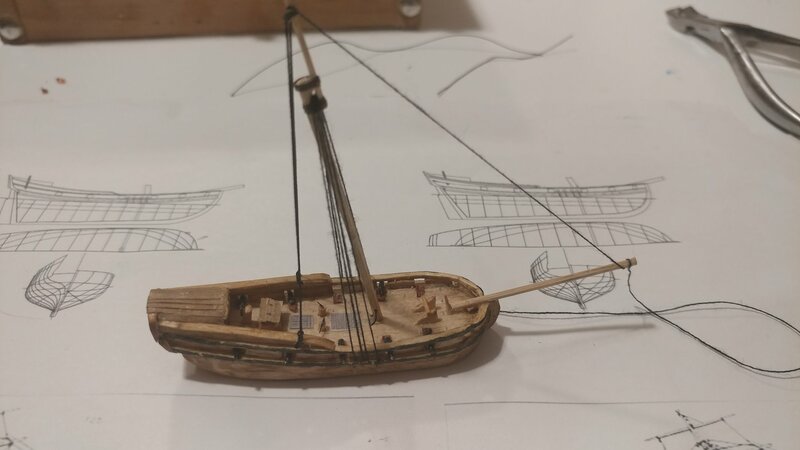 Next part is the windlass. The windlass is used to haul anchors and other heavy things on and of the ship. Breaking it down the simplest form is two triangles and a cylinder. 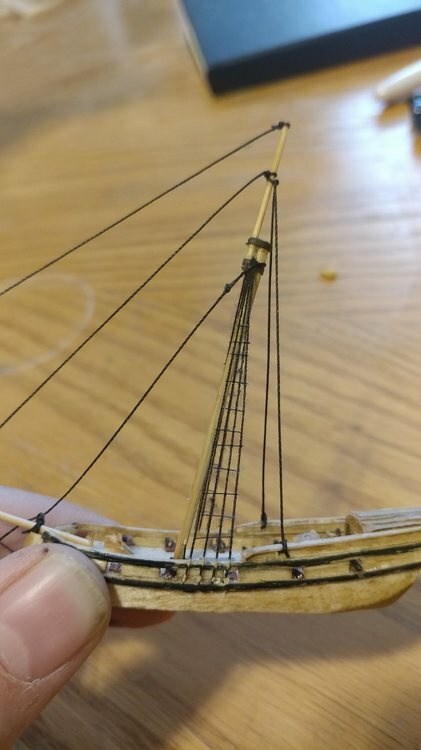 Glue those right on deck just behind the bowsprit. Also another couple small pieces. 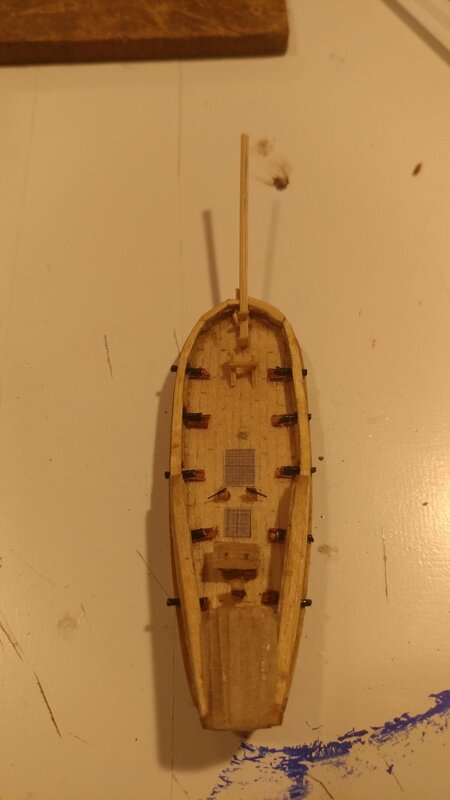 I put in a couple rectangular pieces one just behind the bowsprit and one on the bowsprit. 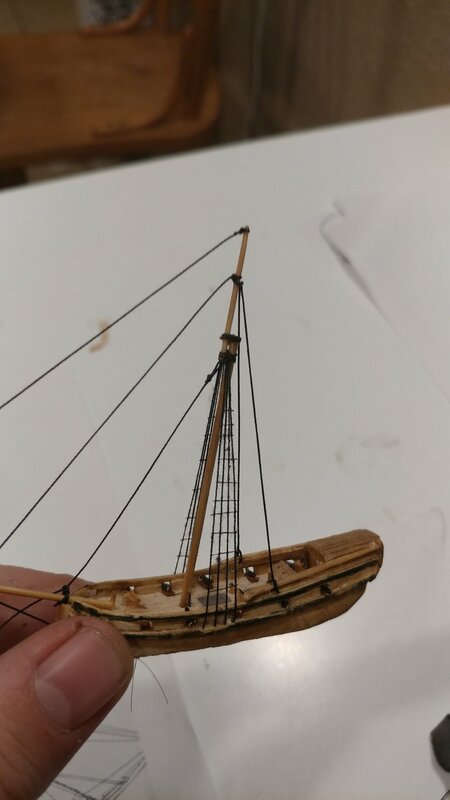 Looking at the photo of the other model it looks like theres a block on a stand just behind the bowsprit and a ships bell on the bowsprit. 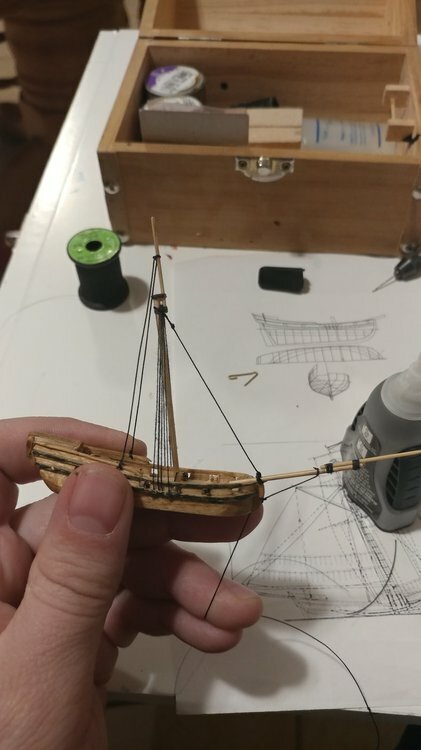 I did a ships bell this small on the Scavenger but being a beginners build I thought a rectangle on the bowsprit would work. I'll put a dot of gold paint where the bell goes. From here I need to add cannons and then start on masts and rigging. Time to put some cannons in. Going back to the concept of putting together shapes a cannon consists of a cylinder sitting on a rectangle. For the cylinder I opened up an old cell phone charger cable and pulled out the black wire. For the rectangle I found a nice dark veneer and cut strips. 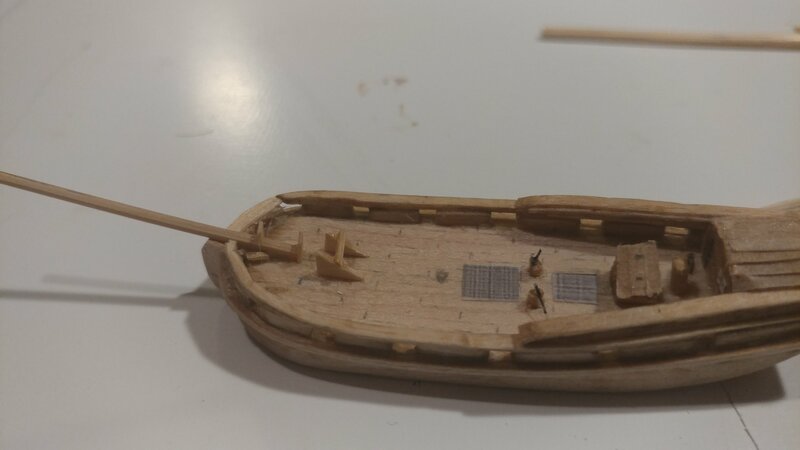 I still had to thin it a bit to fit the cannons in the gun ports. Good to be aware of sizing on this part. 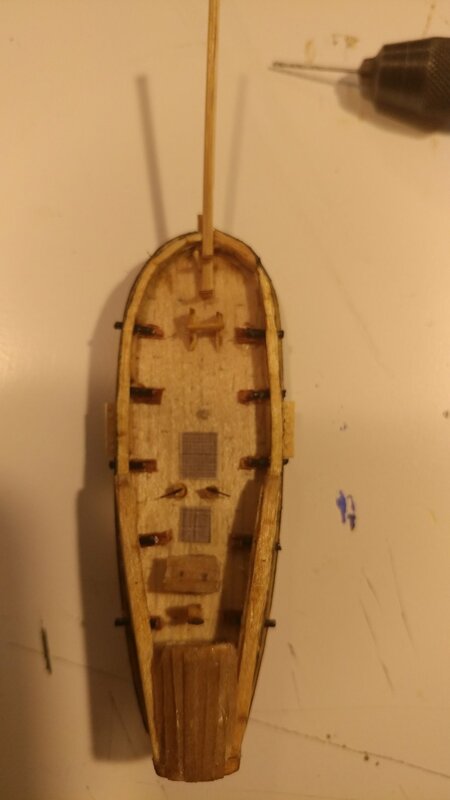 Here it is with all the carriages glued in. If you can get a hold of or build this tool I highly recomend it. It really helps keep my length cuts consistent. Here it is with cannons. 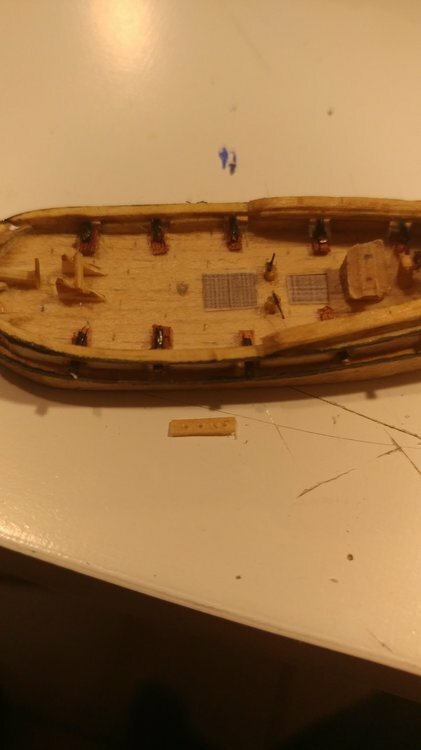 One of the last parts the hull needs is the channelsnfor the rigging. This is the piece chain plates and deadeys attach to on real ships. 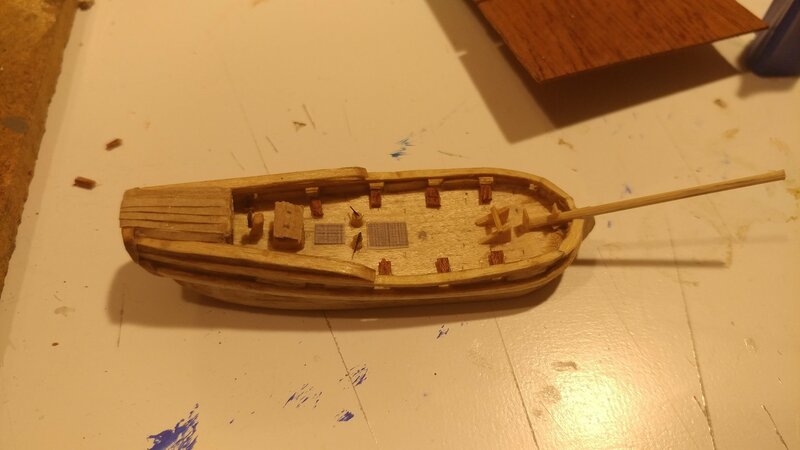 For this I cut a piece of veneer, drilled four holes and glued it to the side of the hull where the backstays will attach. This piece will be used for those back stays. 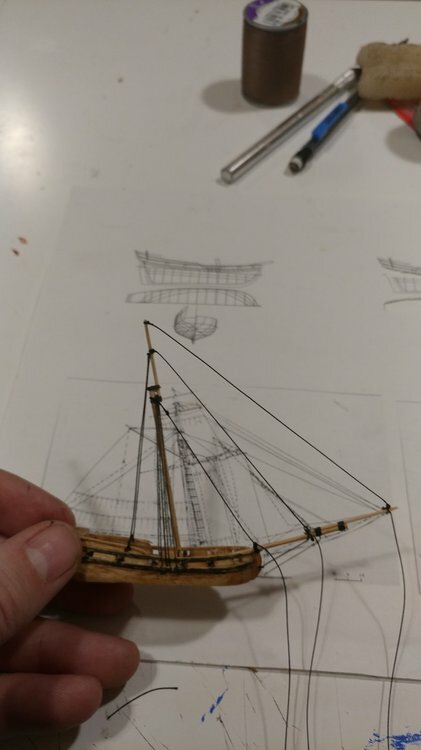 Starting to get into masts and rigging. More to come. 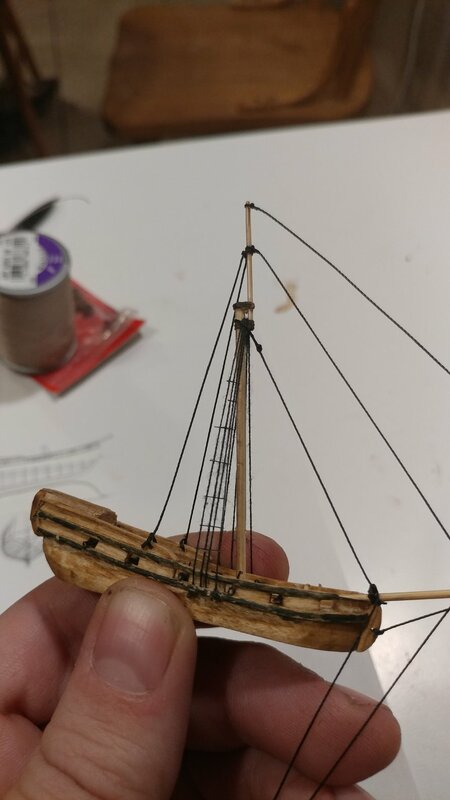 It’s always a challenge getting the detail right at this scale and you are doing a wonderful job! For masts I use bamboo. I like it for its durability and because its in expensive. 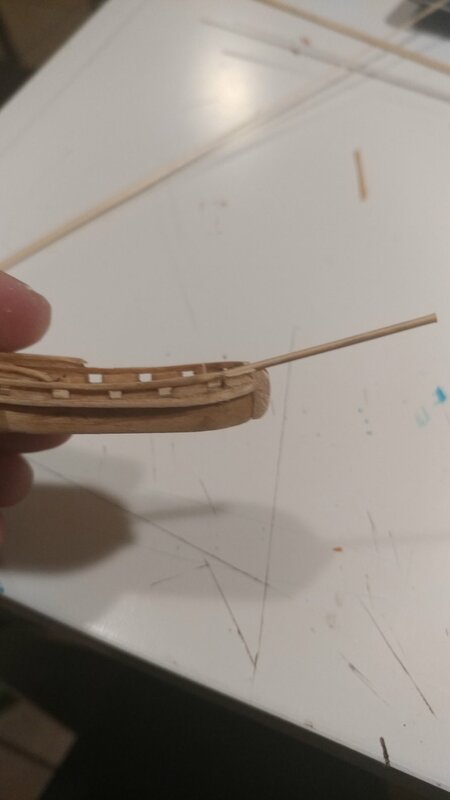 A package of bamboo scewers runs around $3 and holds enough for several ships. 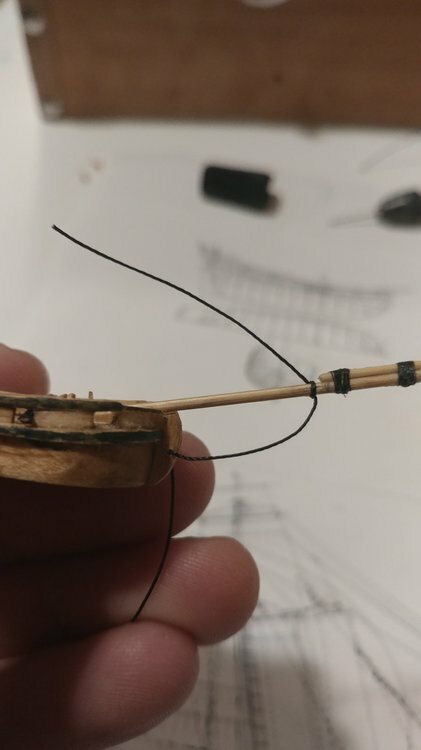 I cut my bamboo in section long ways and use a drawplate to get smaller round sections. I then put these pieces in a drill to smooth them out and add a bit of taper. Tapering masts and yards really adds to the realism and doesn't take to much extra time. As a cautionary note, don't spin wood in dremels. They spin way to fast and very often the wood gets off center and becomes a projectile. Drills are slower and safer. 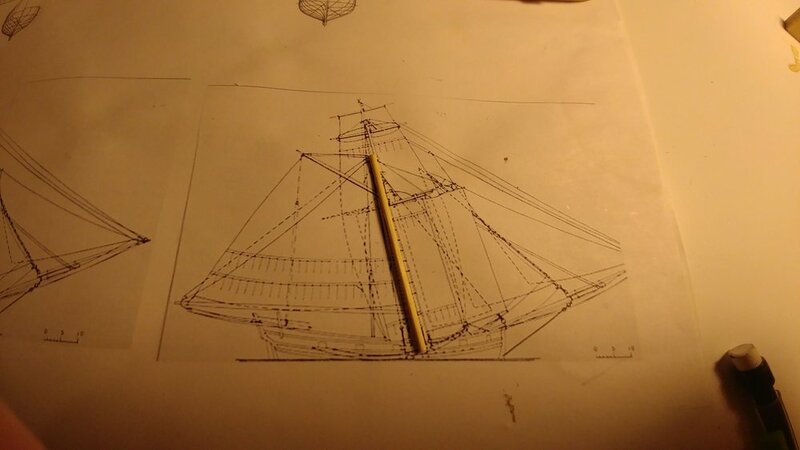 Once I have the mast cut down and sanded I measure it up to the plans and cut it to size. The same process applies to the top mast except its cut down even smaller. From here I cut a couple small blocks. And glue then where the mast doublings are on the plans. I then glue the top mast to these blocks. This creates a small space between the masts which is cteated by the cross trees. From here I cut out some strips of paper and stain them with wood stain. The paper is glued on and wrapped around the mast creating the cross trees. This also helps hold the two pieces together. 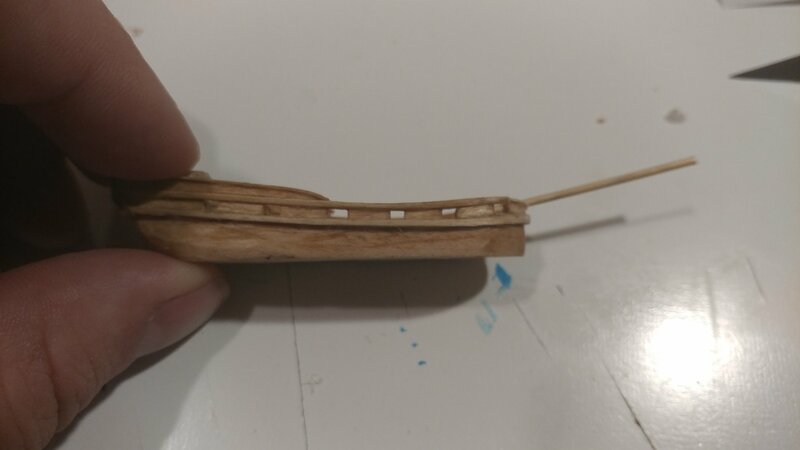 For this ship I'll be using the hinge method. 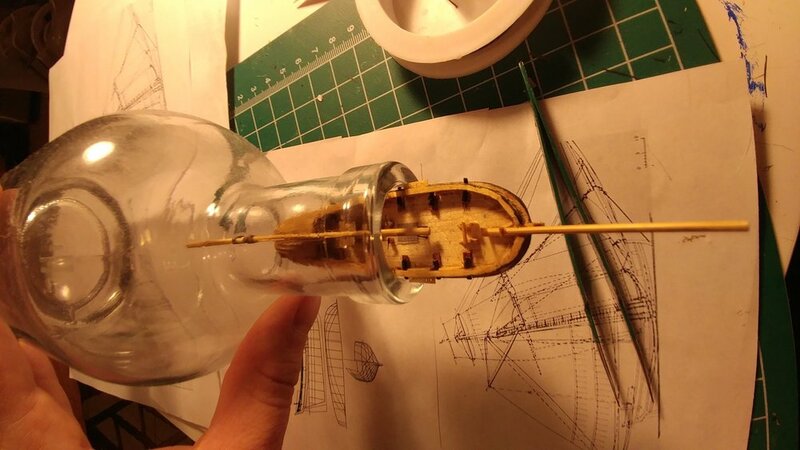 It's a great place to start on ship in bottle building. 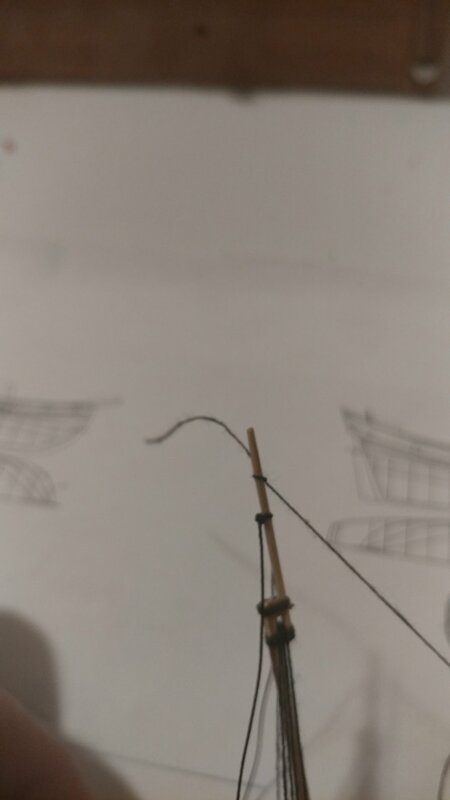 To make the hing drill a small hole in the base of the mast, insert a piece of wire and bend it down. Drill a couple holes for either side of the hinge where the mast will be placed on deck. 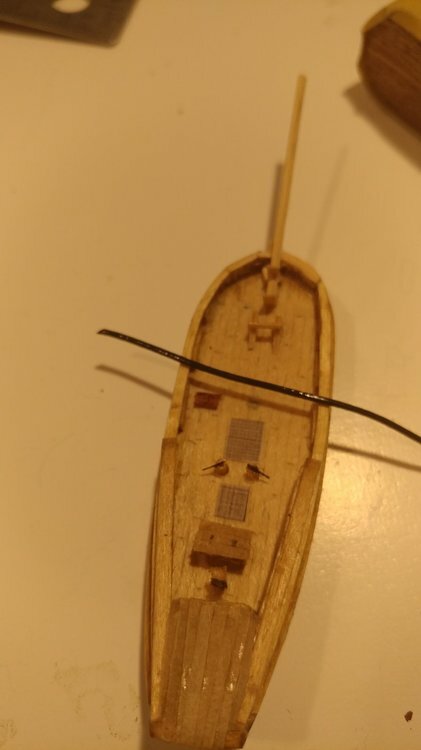 Then trim the wire until it hits the bottom of the holes at about the point the bottom of the mast just touches the deck. Glue the wire in place. Test the hinge to make sure it works well. This is a good opportunity to test how well the ship fits in the bottle. 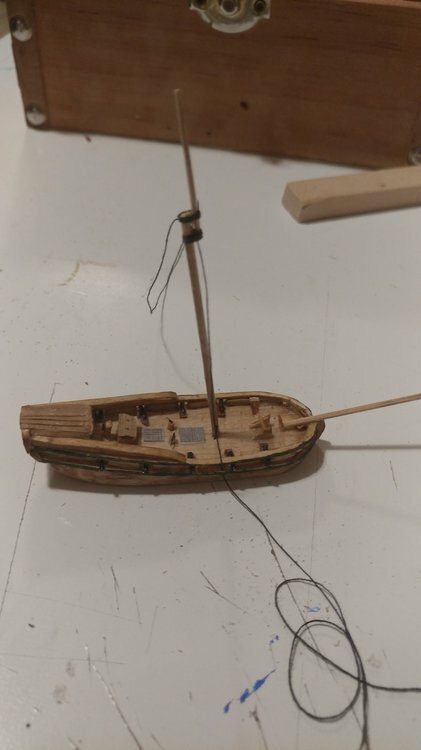 The mast works fine but my channels are a bit to wide. Gotta fix that. One more note on masts. I typically don't drill a lot of holes in masts. 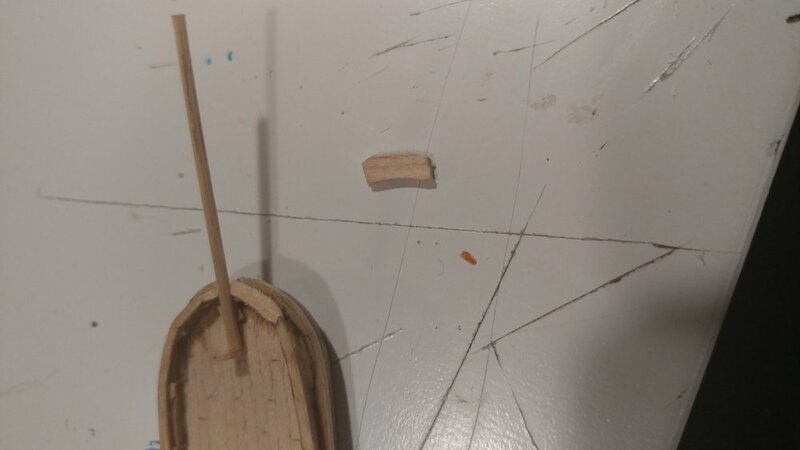 The holes can easily cause the mast to break. Thinner masts look more realistic but are more fragile. To keep them strong I will be using knots to put on the yards. 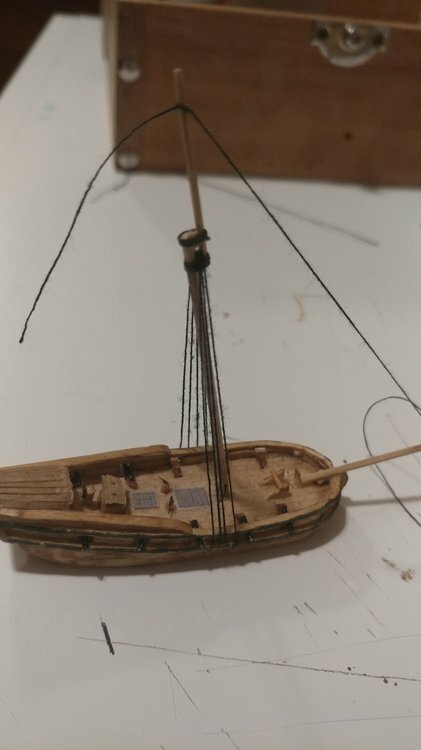 How ever for this build there is one more hole needed in the mast. 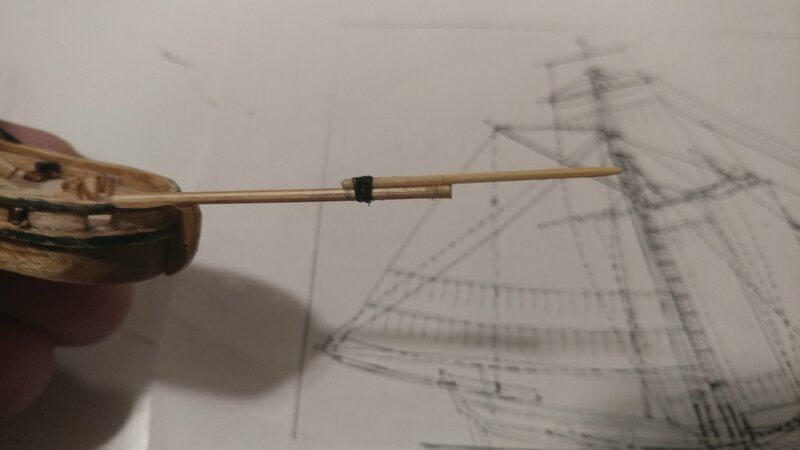 It goes where the boom connects to the mast and will help with rigging the boom. I must say, you've inspired me! The bermuda sloop will be my build #3. I need to get back to this. Work has taken over for a while. I think things are starting to settle down. I'll get back into the rigging soon. I just got the same bottle... I'm ready. Time to get into the rigging. First thing I start with is the back stays. There's a lot of different methods for this. Use what ever method works best for you. This method has worked for me. 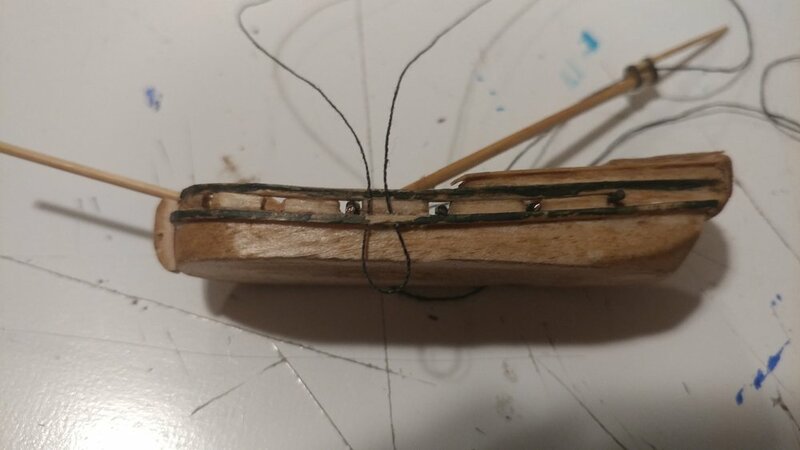 Typically I create a channel specifically for the backstays and glue it onto the channel where the stays connect to the ship. Since I mismeasured a tad my ship is a little to wide for that. So I drilled my holes through the existing channels. When drilling these holes be careful not to make them to wide or to close together. They need to be wide enough for the thread but not much more. I'll explain why at the end. 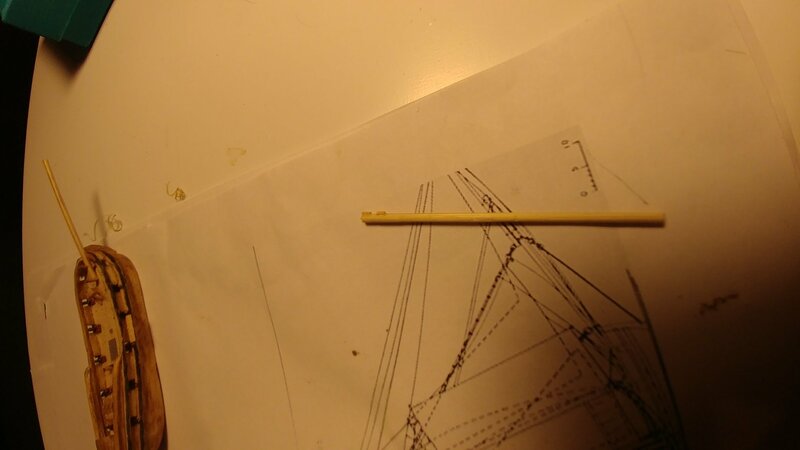 The backstays will be created using a single piece of thread. Pass the thread through through the channel and up through the gap in the two masts. Then done to the holes in the channel on the other side. The thread will pass down one hole and up the next. Then it will run up to the gap in the mast and down to the first channel. In this way the thread weaves back and for between the two channels and through the mast. Once you go through the last hole tie a stopping not, put a dab of glue on it and pull it into the channel. This is where the size of the holes and length between them matters. 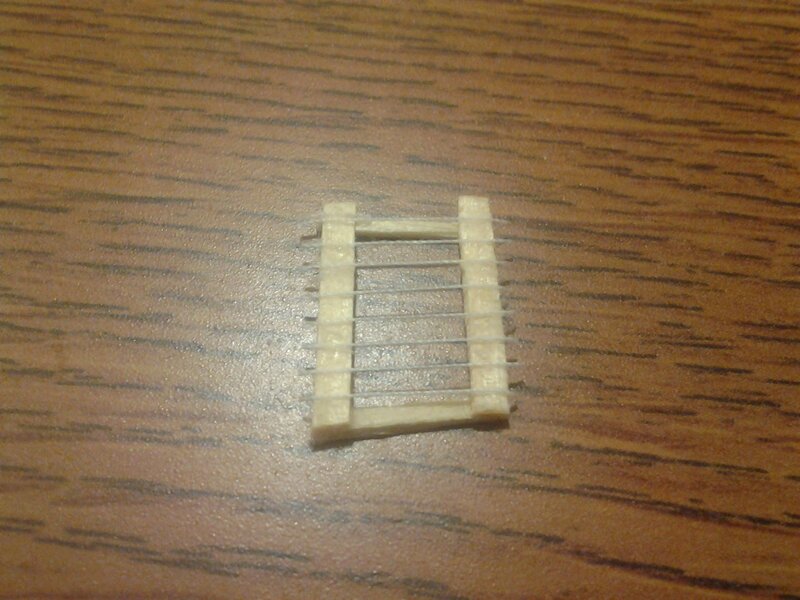 You can easily pull the thread out between the two holes if they are to close or the wood isn't strong enough. This is partially why I like having a separate glued on channel. If it breaks it can be cut off and remade. Its not so easy with the longer channel. It also looks more accurate. 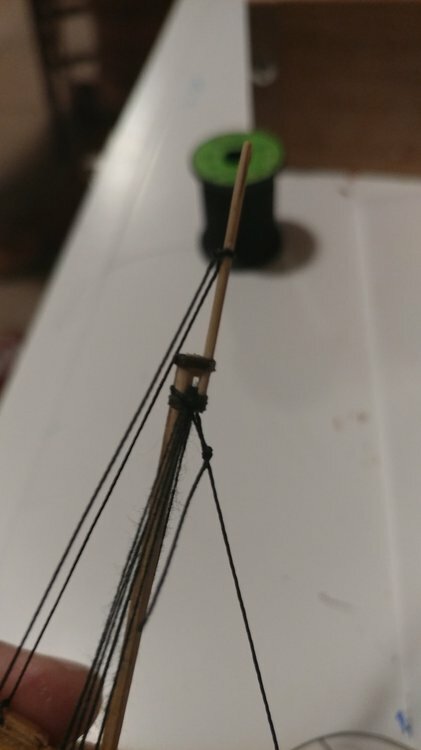 I tied two to make it thick enough and you can see I missed once. No worries that piece will be cut off. Once the stopper not is in place, pull on the other end of the string to tighten up the lines. Keep in mind that with the folding method the tension on the backstays will set the rake or angle of the mast. Tighten up the lines to get the right mast angle. Then on the loose end I put a little glue on the thread and pull it through the channel. This helps keep the tension right as I tie it off. Once the glue sets I tie a knot around the channel, glue it down and cut off the excess. This is the result. My thread is more frayed than I like but hopefully a little more wax will cure that. The forests thread is temporary for now. One more set of backstays will go up to the top mast but after that we move on to the fore stays. To give a better idea on this style of rigging, the following link is where I first discovered it. Jim Goodwin shared it a long with a lot of other tricks on the PBS show the Woodwrights Shop. Honestly the ship he demonstrates in this show maybe a better beginners model than this Bermuda Sloop. For some of the next parts I'm going to use what called a thread block. John Fox III has created an excellent video demonstrating how this works. 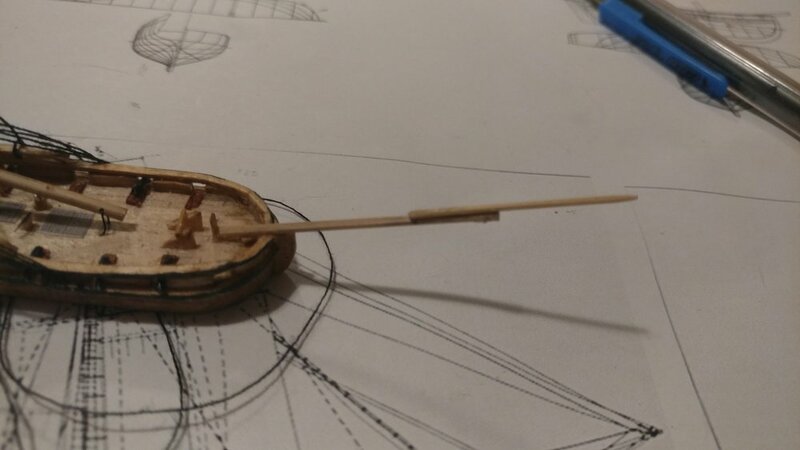 This thread block is part of how I get away with thinner, somewhat closer to scale masts and yards. The smaller the dowels get the harder it is to drill holes and the holes compromise the integrity of the mast and yards. 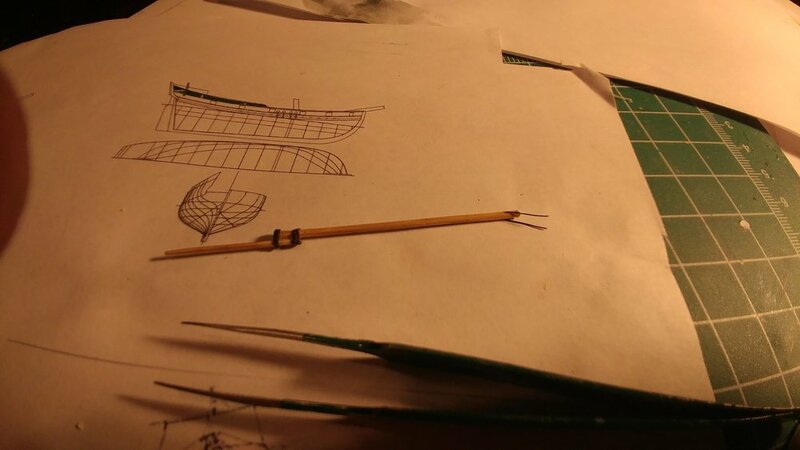 Tying thread blocks creates places for lines to pass with out compromising the strength of the mast and yards. First one more set of back stays. Following the plans I drilled a hole in the bulwark. I then tied a line to the top mast about mid way down. 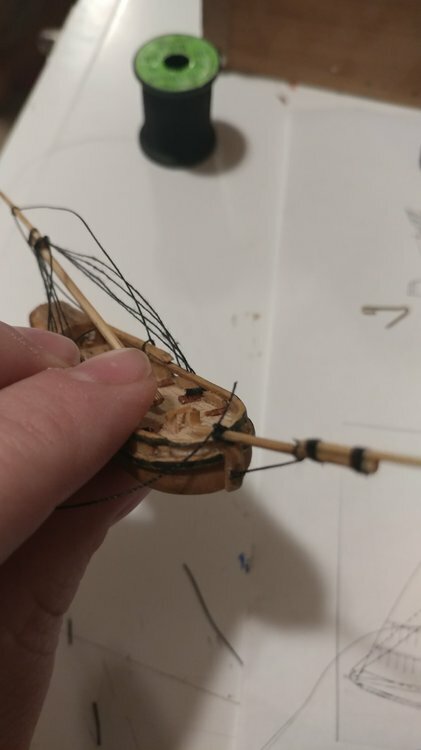 I gave it a little glue so it doesn't move then ran the lines through the holes on the bulwarks. 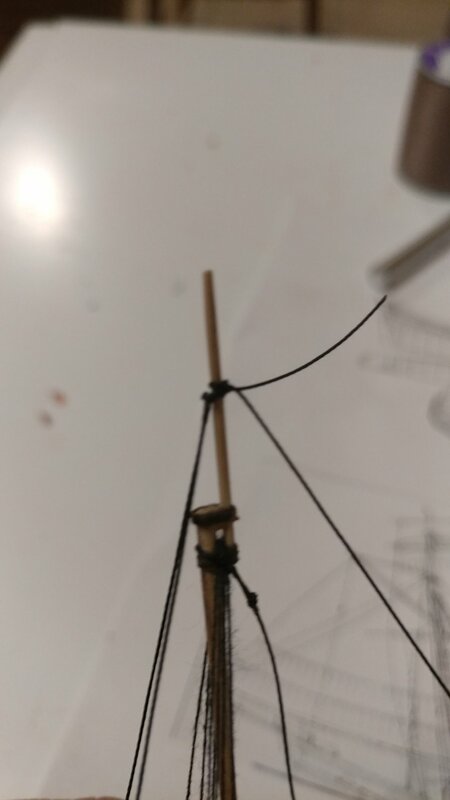 I then tied my temporary forestay on and set the rake angle. These back most back stays are the most important in setting the rake so the must be perfect. Once the rake is set I secured my temporary forests on the bowsprit with a tiny amount of glue. Enough its easy to pull off but also enough to hold the rake while I adjust my back stays. From there I pulled one backstay tight and tested the rake and strength of the forestay. Once all was secure I pulled the line out just a little, then put a little glue on the end going into the hole and pulled it back tight. 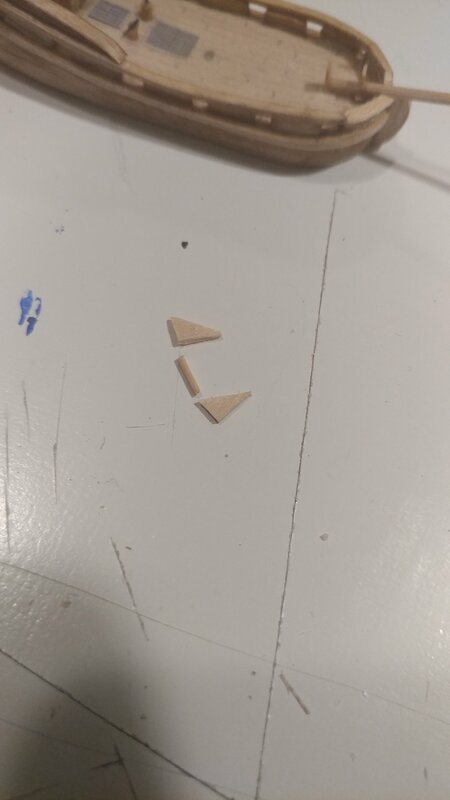 Once the glue set I did the same on the other side. The glue holds the line in place while I tie a knot around the bulwarks. Once the know is secured I glue them down and cut off the ends. 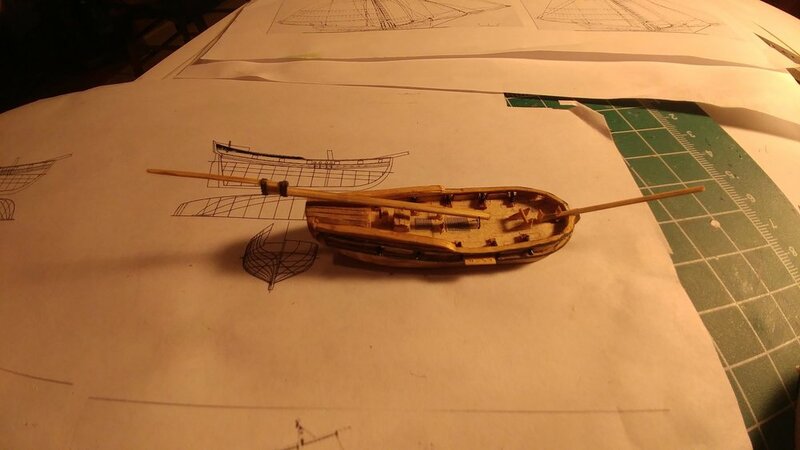 Once done in can take off the temporary line and prep the bowsprit for the fore stays. 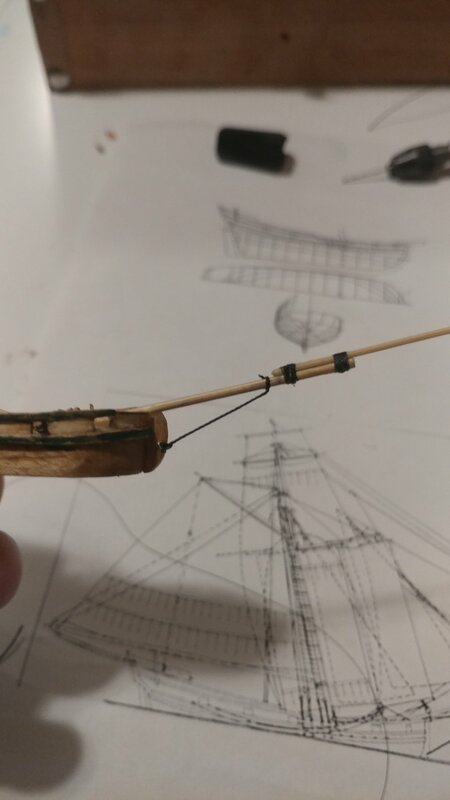 For the rest of the bowsprit whittle out a really thin piece of bamboo cut it to size from the plans and then taper the end. 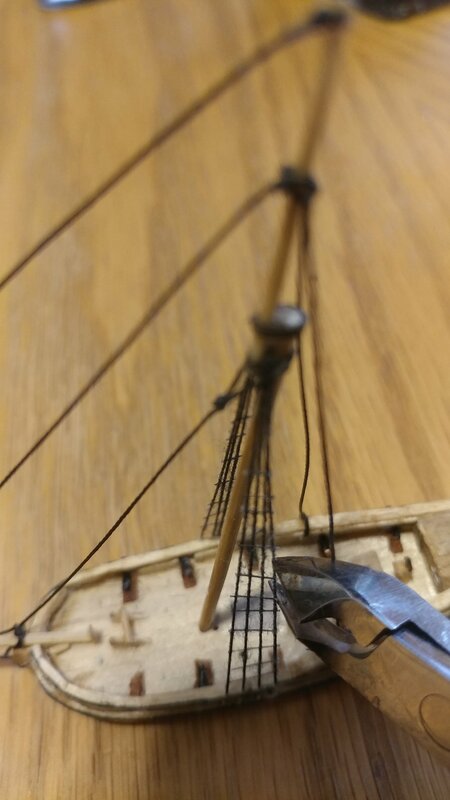 With a pencil mark where the end of where the two bowsprit pieces overlap. Then glue them together. 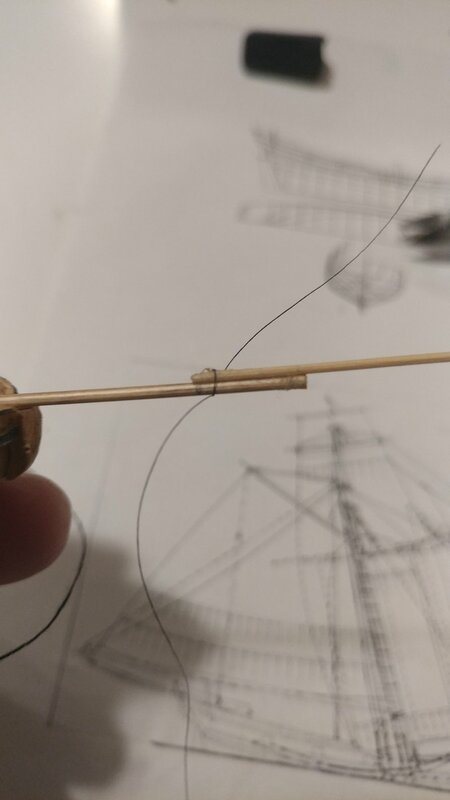 I got some 8/0 fly tying thread and tied a knot around one end of where the bowsprit pieces connect. Then I wrapped that thread around glued it down tied it off glued the knot and cut off the ends. It will look like this. Then I did the same on the other end. Now its ready for the bobstay. The bobstay strengthens the bowsprit even at this scale. 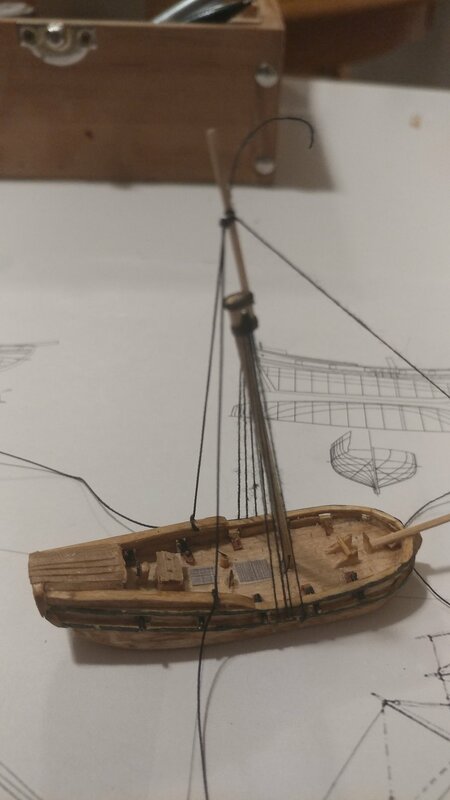 I've had ships where I put on the forestay before the bobstay and the whole bowsprit bent upwards and almost broke. The bobstay keeps the bowsprit straight when the forestays are pulling on it. First drill a hole in the keel. The plans shows where this stay will connect. 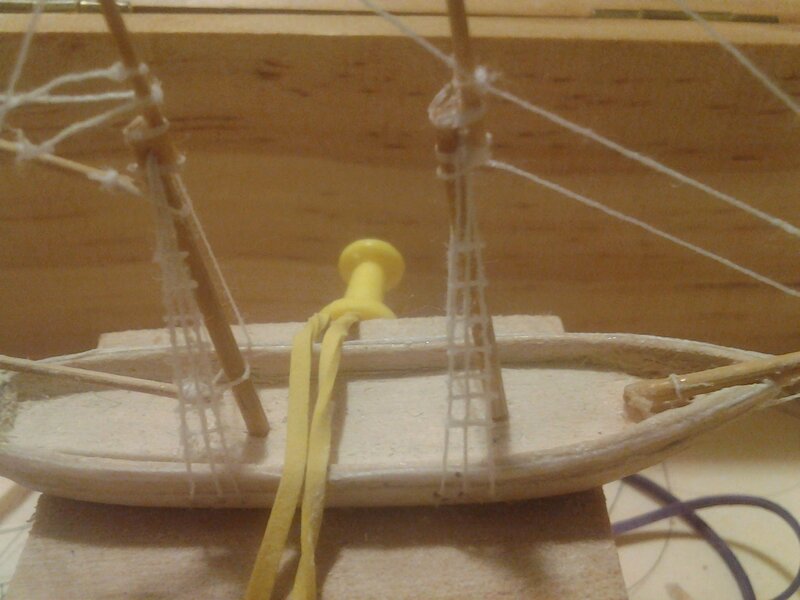 Then tie a knot on the bowsprit and run the line through the keel. 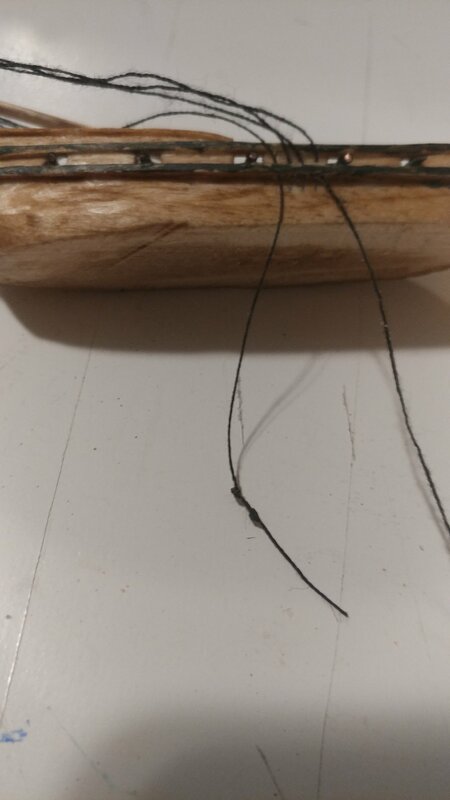 Glue the knot down and put a dab of glue on the line your about to pull through the keel then pull it through. Once that sets tie it off glue the knots and cut off the excess. Now its time for some forestays. First tie a thread block. See the video above. The hole of the block should be wide enough for your thread. I used wire instead of a needle for this one. 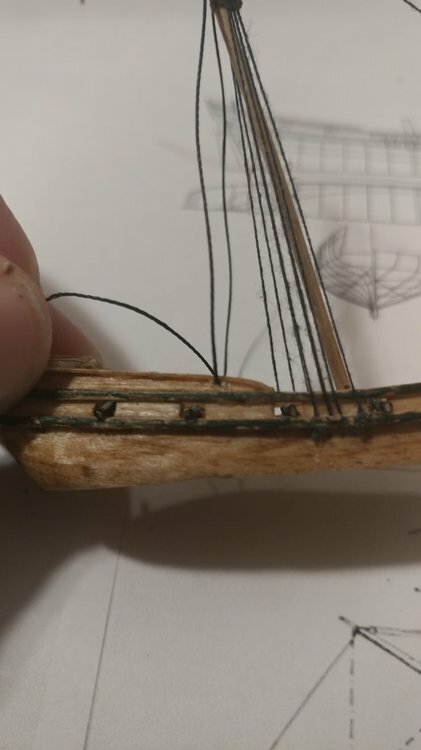 Tie the thread block to the bowsprit. So that I don't run into forestays as I complete them, I'm starting with the inner most one. Tie the thread block on with the block facing upwards. Tie it and glue it as usual. Now for a little more added realism I tied a slip knot around the mast just above the lower cheek. I tightened the knot until it looked right leaving it slightly loose. I glued the knot down and put a dab of glue where the line connects with the back of the mast. Cut off the excess and then thread the other end of the line through the thread block. Note this line should be long as it runs out of the bottle. All caught up. Awaiting your next orders, commander. Thanks Jeff. I'm very happy to see a few of you following a long. Let me know if you need better explanations of any part. Onward With standing rigging. Create two more thread blocks to tie to the bow. Per the plans they should be right before the back of where the back of the jib boom attaches to the bowsprit and the very tip of the jib boom. On the last forestay I left a loop because the line goes around the cross tree. For the next to I tie them directly to the top mast so there is no loop. 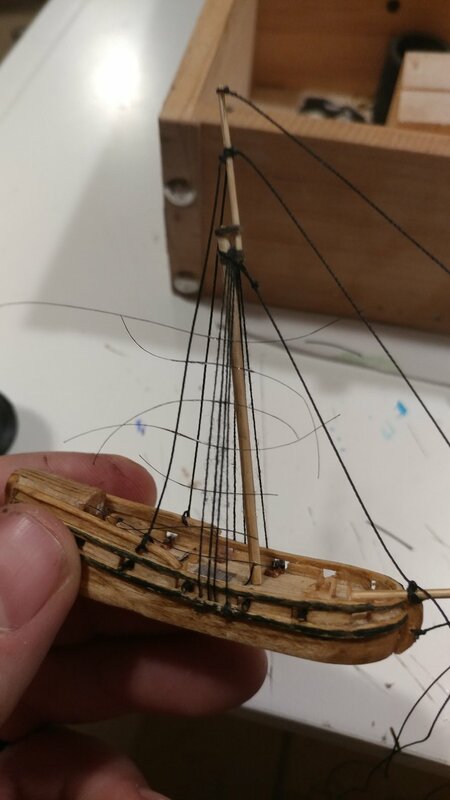 Tie long threads onto the top mast and run them through the thread blocks. These lines need to be long enough to run out of the bottle. I'm not sure I talked about the rat lines. My method for this is simple. Pull the lines so the shrouds are nice and tight. Cut a small piece of thread. For this I used 8/0 fly tying thread. 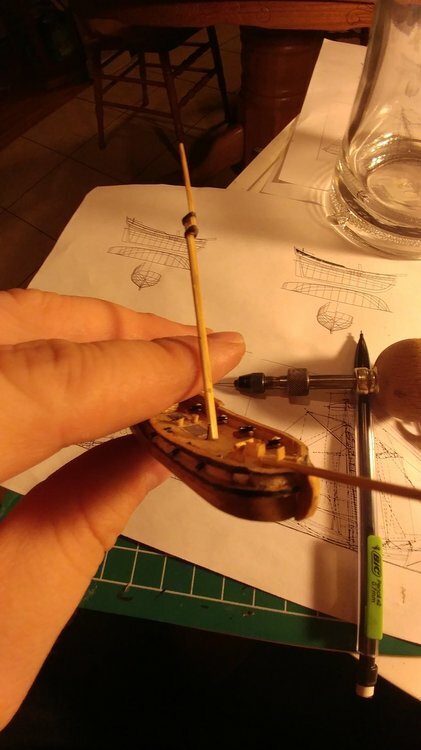 Its slightly smaller than the thread for the standing rigging. 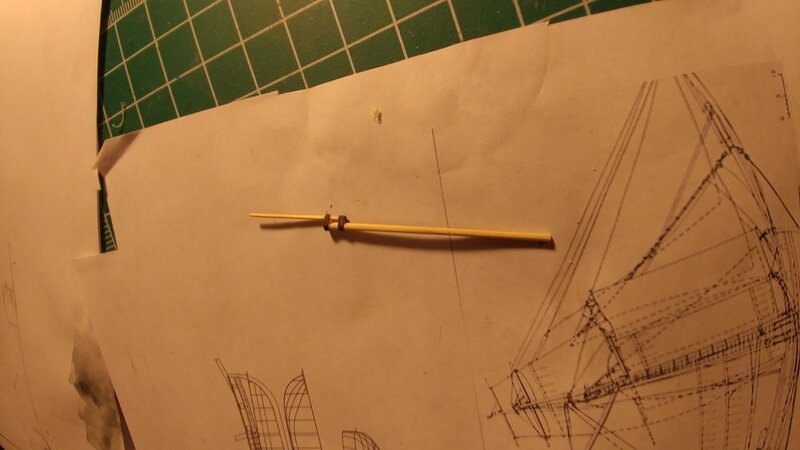 Holding the 8/0 thread on either side and get some glue on the middle of the thread. Use a dowel or the glue bottle to spread this a little and wipe off the excess being careful to avoid the edges where your fingers are. Then place the line one the shrouds and hold until dry. Once all the lines are on cut off the excess. For this method a fast drying glue is required. There's good and bad to that. Super glue dries hard and can break. I try to use as little as is necessary to get the job done. That's a fine are to learn. There is another method if you want to avoid using super glue. Make a frame out of thin wood. 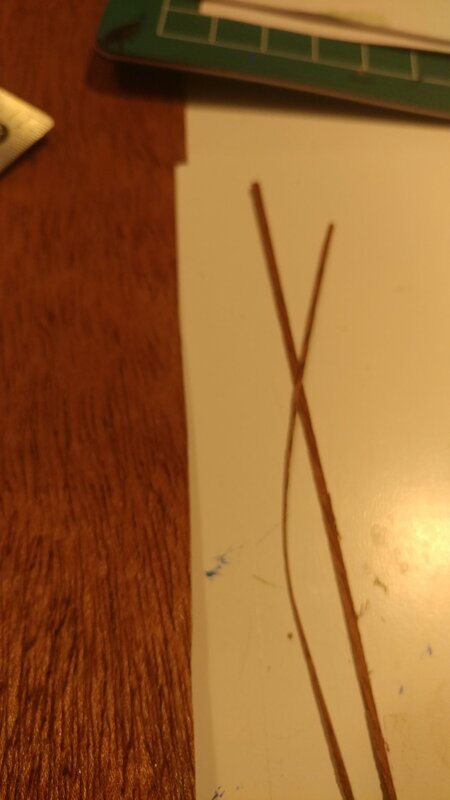 Matches or toothpicks work well. Glue the ratlines onto the frame so that they are evenly spaced a part. Place the frame over the shrouds and glue the ratlines to the shrouds. Since the frame is holding the lines in place you can leave the lines to dry. Then cut the lines outside the shrouds to remove the frame and trim the excess. When it comes to trimming lines there is a special tool I use that makes for a really close cut. Follicle clippers from the grocery store. They run around $8. 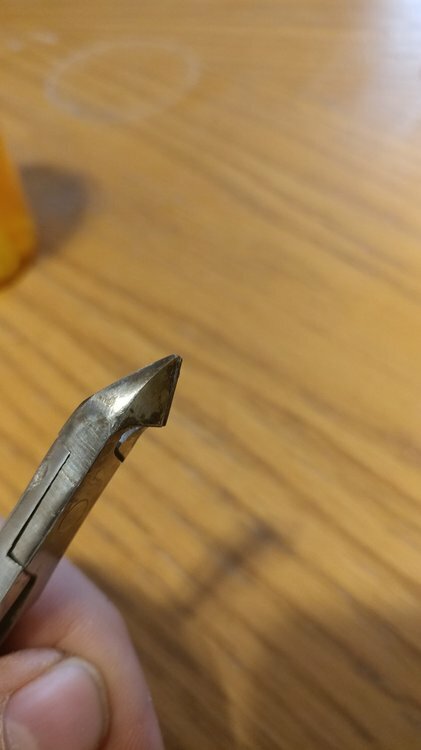 Note how straight the edge is and that it cuts off to the side. I can place that edge right on the shroud and cut the ratline super close with out cutting the shroud line. To show this look at how close the ratlines are cut at the edges of the shrouds. Something to note with these clippers. 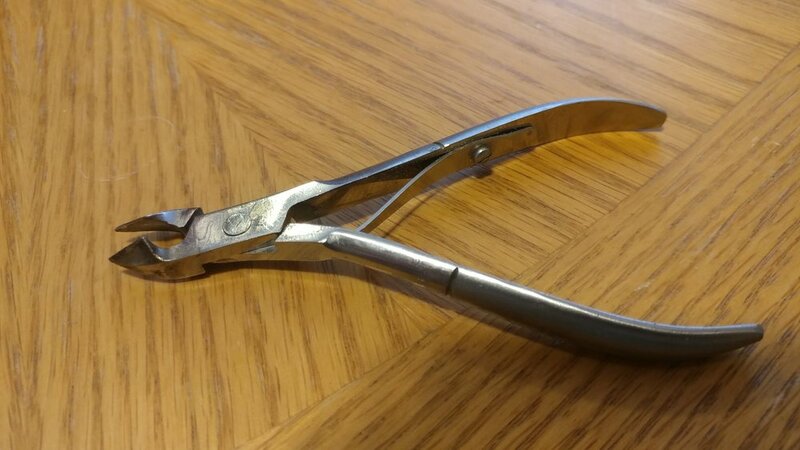 Treat the like your mothers sewing scissors. Once you use them for anything but thread the edges get bent and they will not cut thread cleanly. I have an old pair I use for wire and a new pair I use for thread. 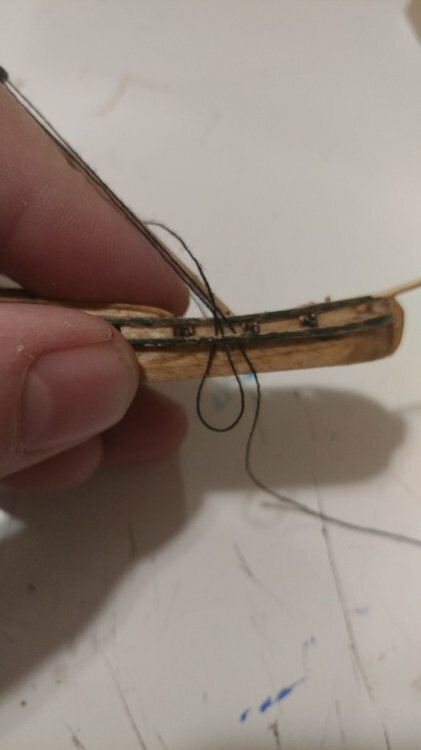 When I buy a new pair I mark my thread ones as my wire ones and throw out the oldest pair. I use these for cutting all of my lines specifically because I can control exactly where I make my cuts. An example of the frame method. I tried both ways. I'm passing on the ratlines. 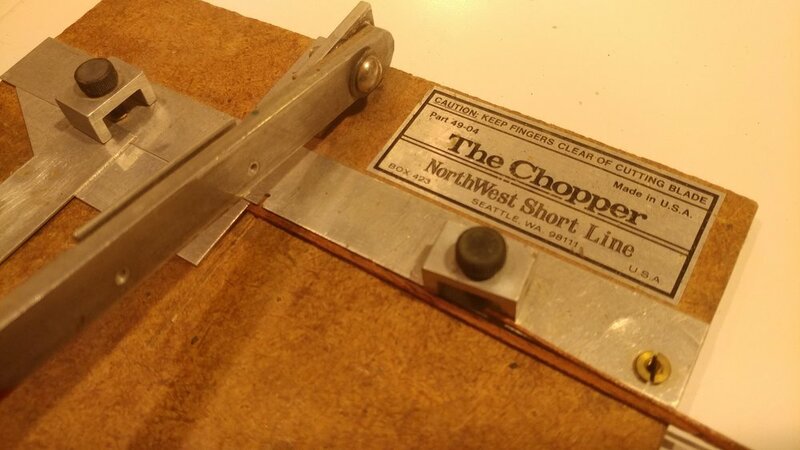 I've attached an article I produced for Bottleship a few years ago on a Jig for making ratlines and railings. It may help out. It helped me. loking at D's and ex's i think I can come up with something. I noticed that there are tiny spots on the mast rigging at the channels. How are they made and why? Oh yeah I was going to explain those. 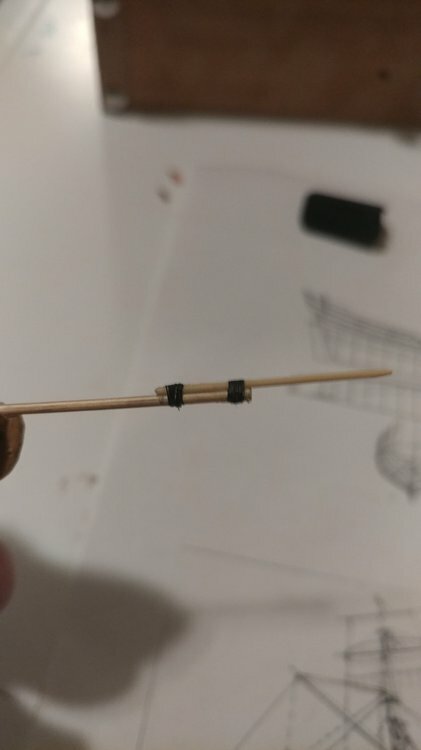 I've experiment with various ways of doing dead eyes and I thought I'd add one method into this beginners build. This is purely optional and their are other more advanced methods that work well but if your just starting out this method works pretty well. What I did was get some paint on the end of a toothpick and just tap the back stay where the dead eyes go. Let the paint dry and do this over and over until the paint builds up into a little dot and looks like a very tiny dead eye. It will take five or sick coats so be patient with it, of coarse thats the name of the game with this hobby. Still lurking in the shadows here. I still haven't fixed my Galleon. 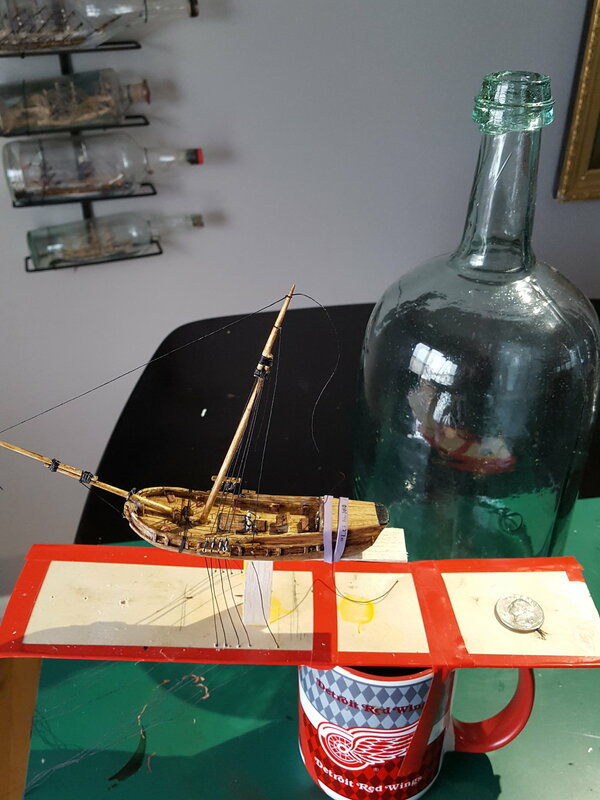 I am however adapting DSiemens sloop slightly as I have a really big bottle with a very small neck Im using. 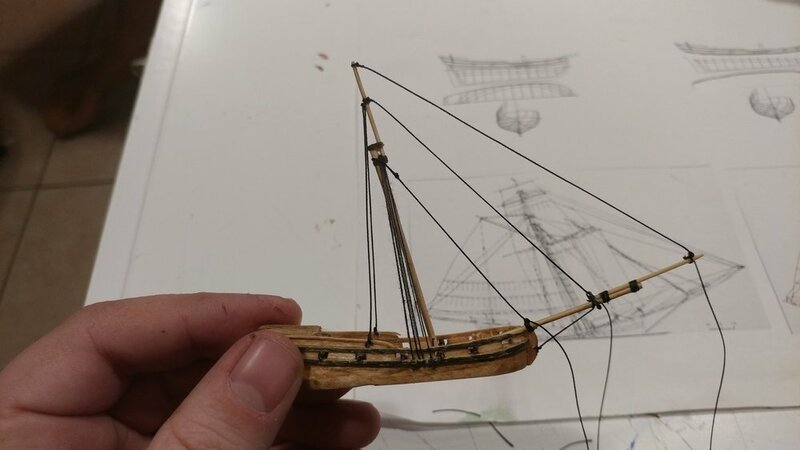 My sloop hull is split into 3 sections and my rigging will be slightly different but following these instructions otherwise. Looking good. I like your bottled ships wall display in the background. Very nice.